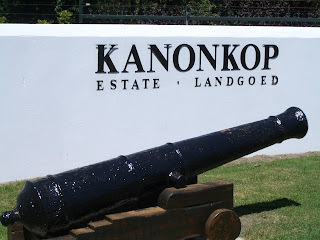 When Kanonkop throws a party, it starts with a bang! There was a real cannon on the grass, a red box marked ‘Danger - Explosives’ and a man with a smouldering fuse. We’re standing around, glasses in hand, offering jocular advice to the man with the fuse and a cannon loaded with gunpowder that refuses to light. It takes a couple of attempts before there is an incredibly loud explosion, a jet of smoke and shaking trees and we’re stunned to silence. Inside the tasting room we find chairs and take glasses of Kadette 2005, followed by Pinotage 2004 and then Pinotage 06 from the barrel and 07 from the tanks. The 06 has sweet beautiful welcoming fruits - mulberry/blackberry with spices and coffee tones. Superb and stunning. From the the old vineyard, 3 tons per hectare, 16 months in 100% new French oak barrels. The 07 is just starting malolactic fermentation so it’s too early to form any judgement, but it has intense colour and bubblegum flavours and tonight we’ll go from this juice that is not yet a completed wine and taste back through the vintages to 1995. 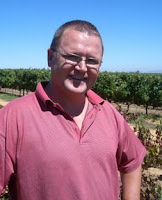 Johann Krige, co-owner with brother Paul, has the job of welcoming us and introducing the event, which is an annual occasion for friends of Kanonkop. “This is an informal evening”, Johann tell us, “it is all done in house – there’s no catering firm” as he introduces his brother Paul who has the onerous task of running the braai , cooking the snook and feeding us all. 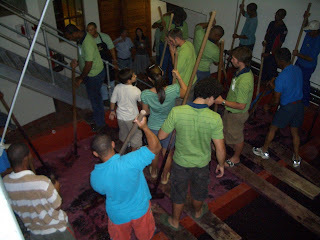 Then we are invited to visit two tasting stations in the cellars for verticals of Pinotage and Cabernet, to wander through the winery and to assist the cellar staff with the two hourly punch-downs of the cap of skins that form on the fermenting grapes in the open tanks, and not to forget the braai. It is now past midnight and, although many people have left, there are deep discussions going on and bottle after bottle of Kanonkop still circulating. Never mind tasting note scores – it’s the one you choose to drink when you have your choice of them all that is the real winner.